Awhile back, we talked about pre-bath time dog grooming tips and how to get your dog ready for bathing. Today, we are going to discuss a few tips on bathing your dog. Whether you are a new dog owner and are inexperienced with bathing your dog or have had years of experience, there are always great dog grooming tips you can pick up to help your dog’s bathing time go more smooth and efficient. 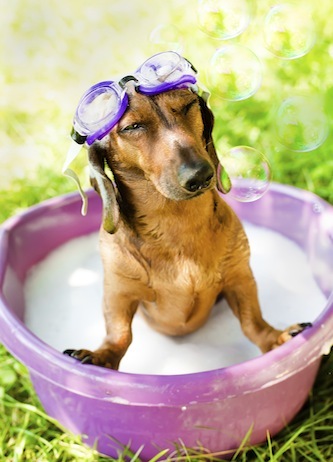 We understand that bathing your dog may not be on the top of your list of fun things to do, but with these few tips you will be more prepared to make it a more fun and easy experience for your dog. First thing’s first. You want to make sure that your dog associates bath time with something good. No matter the type of dog you have, you can help them feel more comfortable by associating good things that your dog loves such as their favorite toy, special treats, a walk, playing his favorite game. Whenever you give him a bath and then reward him with those things, he will learn that bath time isn’t so bad after all. A good way to start training your dog for a bath is by teaching him how to get in and out of the tub. You can start with a cardboard box to make it easier and once he has the hang of it, switch to the bathtub. First, show your dog a treat and say, “Get in” and toss the treat inside. After he gets in the box or tub, praise him and tell him to get out, moving away. A treat is only necessary for getting in; as that is the part you want him to like the most. Once your dog is comfortable getting in and out of the tub, you can turn the warm water on. The rest seems simple enough, but there are a few things you will want to be aware of before lathering your dog in shampoo. If you can, put cotton balls in his ears, as they are sensitive. If your dog doesn’t like this, be careful to avoid spraying water in his ears. Use a cup, bucket or showerhead to get your dog’s fur fully wet before applying the shampoo. After lathering the shampoo all over, rinse him, but be sure to avoid getting the water in his ears, eyes and mouth. You can use a damp washcloth to get dirt out of those sensitive areas. Choose the right shampoo – finding a shampoo that is gentle and won’t cause them to have dry skin is important. Speak with your vet if you are unsure which to choose. Start bathing young – It’s easier to get your dog used to bathing as a puppy. It also helps decrease having negative problems when the dog is older. Protect their ears – not only will it be uncomfortable for dogs to get water in their ears, but it can also cause health problems. Drying – some people prefer drying with dog blow dryers. The other option would be using a towel, but beware of the “shake” as they attempt to dry themselves.